The Golden Nugget Lake Charles is an easy two and a half to three-hour drive from Houston.� Its proximity makes it a popular destination for Houstonians and Texans alike. But, what about as a family destination? 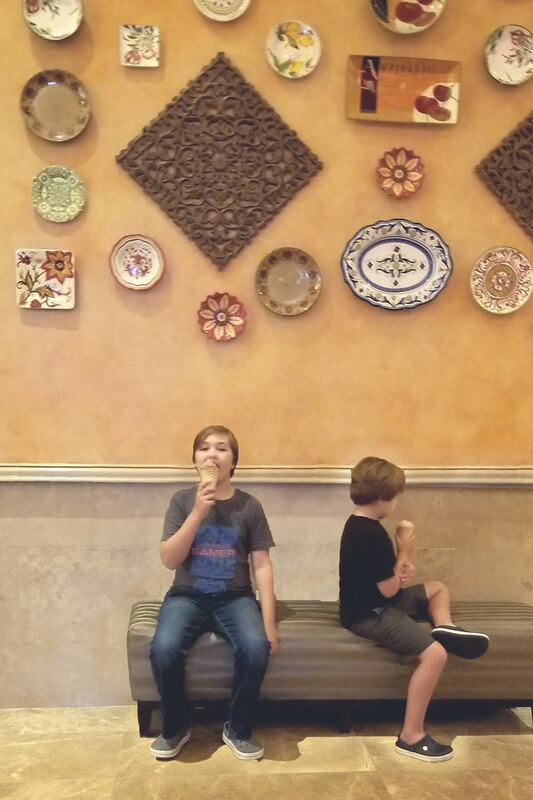 We recently were able to tag along and scoped out all the pros and cons of heading to our neighboring casino with family in tow. Should I plan a trip to The Golden Nugget with my Kids? The short answer to “Should I plan a trip to The Golden Nugget with my Kids?” is no.� However, that is in the scenario of having a weekend to find a family getaway. If you are planning a place to go to an adult-oriented destination is never going to be your best option. However, if you are joining family for a wedding or tagging along on a work trip then the answer is probably! The Golden Nugget Lake Charles is a casino first and foremost.� It welcomes kids but does not cater to families.� There are only a few amenities your kids will enjoy so if you are staying longer than a day or two you will probably need to investigate some family-friendly options off-site in the city of Lake Charles. 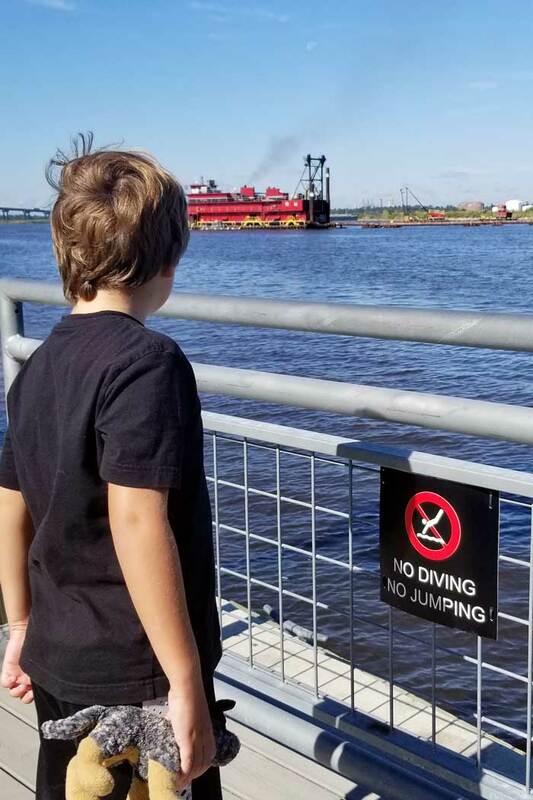 What to do with your Kids at The Golden Nugget Lake Charles? The pool is very nice and has a family-friendly area.� There is a mountain with two slides – one open and one closed. Additionally, there is a short lazy river that loops the slide mountain.� It has a nice current to keep you moving and a waterfall. If you have taken your kids to Schlitterbahn it is nothing like their River of Death (a.k.a. Torrent River) it is exactly what you want in a lazy river – aside from failing to swing by the swim up bar… The pool area is separated into two areas.� A family-welcome shallow area and a roped off deeper section of the pool that has access to a swim up bar.� Both sides are surrounded by sunning pallets and all of the middle of the pallets in the middle of the pool are available for rent. This area is perhaps the only place on the entire property that I could gripe about cleanliness.� I’m not sure if the family side gets the older pallets or if kid funk makes them inherently dirtier but the mattress pallets on the family side were in need of cleaning.� Along the seams, there was a lot of mildew/mold build up so much so that small worms were wiggling around in the muck!� Eww!� That being said we mentioned it to a pool attendant and the pallets were perfect within 24 hours. I don’t know if they cleaned them or put new ones out but amazing turn around on that one! Other than this lapse every other inch of the property was spick and span!� Disney would be proud. The pool area was where we spent the majority of our time and our kids were pretty content to play here for as long as we let them. Tubes and towels are provided. There is an area referred to as an arcade.� It is clearly an afterthought.� It is all but hidden underneath some escalators near the Buffet. About half of the room is claw machines.� �If it doesn’t have Skee Ball and Air Hockey I refuse to call it an arcade! No pictures. It was too sad. The Golden Nugget Lake Charles is situated along Bayou Contraband.� They have developed a nice sand beach area with fire pits, volleyball courts, and a cute burger and shake restaurant, Bill’s Bar & Burger. Personally, I would not let my kids swim there but to each their own. The entire property is swim at your own risk.� There are no lifeguards anywhere. There is a nice boardwalk to stroll. 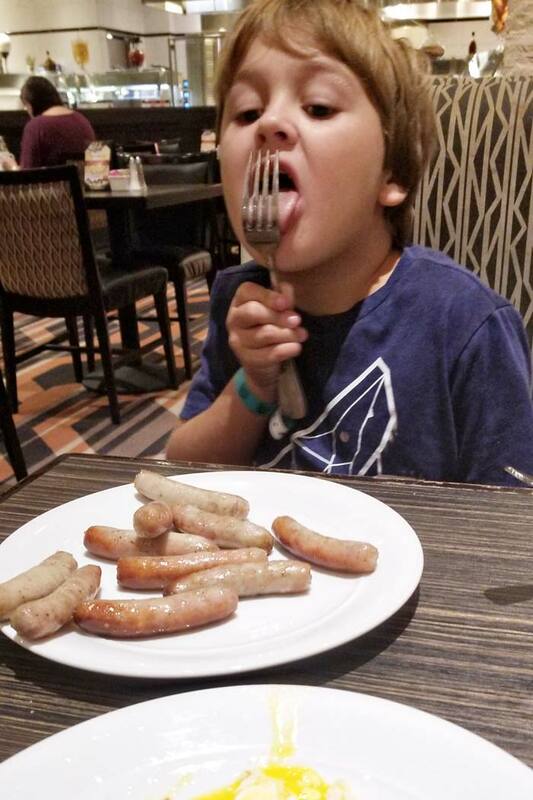 It will take you all the way to the neighboring casino, L’Auberge.� We did not visit but from a review of the website, The Golden Nugget Lake Charles did seem to be the more family friendly option of the two. View of L’Auberge in the background. You should definitely meander the property.� Kids love exploring so let them lead the way. As long as it is a public space you are fine. 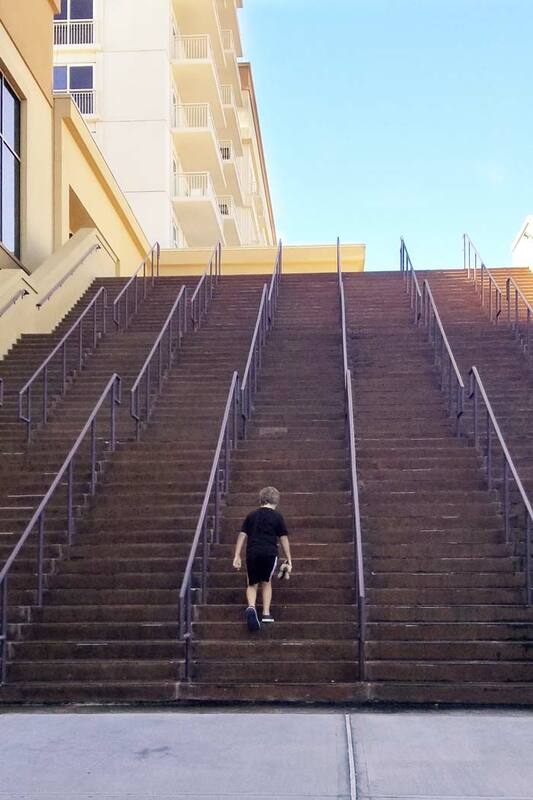 Even if you end up of outside of all the conference and meeting rooms where all the business people side-eye your kids as you wander by… The Marina is a small, just a few slips. There were no boats while we were there but the area is still a nice walk and worth a stroll. There is also a trolley to head over to L’Auberge. If your kids like public transportation it may be a fun free way to kill some time. The resort is also home to tennis courts and a golf course.� If you are a sporting family you may make use of those.� At the very least there is a putting green. If it is not too busy you could probably look into renting clubs and letting the kids put for awhile. I know mine are pretty happy putting on the green in Academy so an actual green would occupy them for a while. Also, there is a small astroturf yard for events but if you brought a soccer ball there would be plenty of room to play as long as an event was not taking place. Ugh, it’s a resort eating is pretty much it’s own activity.� The Golden Nugget Lake Charles is a Landry’s property and home to many of their restaurants.� Several are family friendly and have kids’ menus (such as Cadillac Mexican Kitchen and Claim Jumper) some do not have children’s menus (like Lillie’s Asian Cuisine).� Just check with the hostess stand before making reservations or sitting down. There is also the Buffett, the Chocolate Box, and a Starbuck’s. 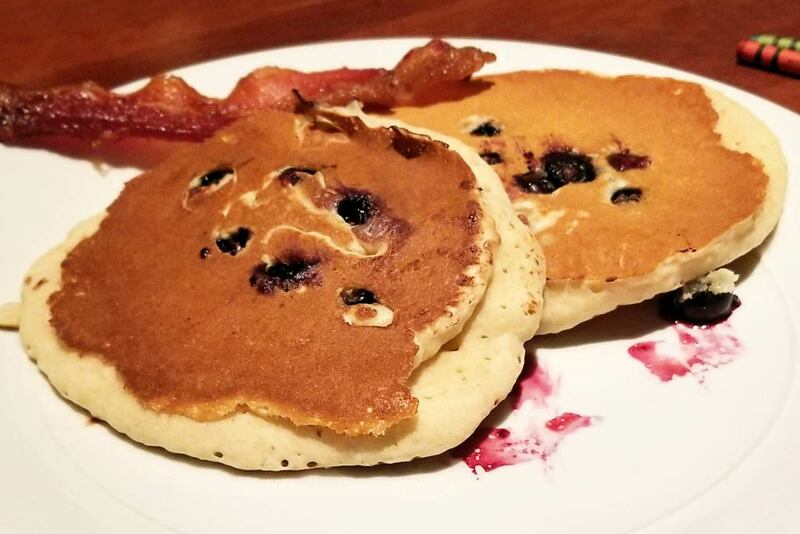 Kids’ pancakes at the Claim Jumper. If you have little ones they could probably share. They are more than happy to add blueberries or chocolate chips, but it is not on the menu! There were plenty of kids about the property so bringing a child would not be out of place here.� And, while children are welcome they are not catered to. Certain family friendly tweaks that could be done are not; like offering in-room babysitting (so Mama could get a massage), providing a decent arcade, or S’mores by the fire on the beach at night. While we had an enjoyable time this is not the kind of place you plan to take your kids but if they happen to be with you when you were passing through then they should have enough to keep them busy for a few days. We had a nice couple of days away and if you are in the neighborhood you will too! If you are traveling to/from Houston you should plan to make a pit stop at the Texas Travel Information Center. Even though it is on the north side of I-10 it is probably a better stop for on the way there because it is only 30 minutes from Lake Charles.� It is run by TXDOT and aside from being a nice clean rest stop, it has a fabulous boardwalk out back.� It is a great Intro to East Texas Gulf Swamps!